Claude Lewis Perkins, the son of James L. and Maude B. (Shaffer) Perkins, was born on September 4, 1936 in Shenandoah, Iowa. 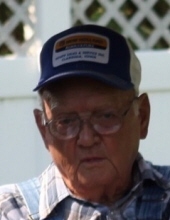 He passed away on November 20, 2018 at the Montgomery County Memorial Hospital in Red Oak, Iowa, at the age of 82 years, 3 months, and 16 days. Claude attended one room schools and graduated in 1956 from the Strahan Consolidated School in Strahan, Iowa. His childhood was spent helping his father on the farm. It was in this environment that he developed a love for the trucking industry and knew at an early age he wanted to drive a truck. On April 1, 1960, he was united in marriage to Sharon "Sherry" Blunt. The couple moved to Colorado where Claude worked on a cattle ranch with his dad. The cowboy life was not for him as he missed the black dirt and cornfields of southwest Iowa. On their return to Iowa, he began driving the big rigs full-time, eventually becoming an owner operator. Claude logged over a million miles on the highways of America, traveling coast to coast and border to border, with his home base being Randolph, Iowa. In 2002, he decided to retire to spend more time with family and to do more antiquing, collecting of old wrenches, reading, and traveling with his wife. Claude loved Allis Chalmers tractors and Dodge pickups. Cops, Live P.D., and Forged in Fire were his favorite programs on TV, blue was his favorite color, and overalls, cowboy boots and baseball caps, his favorite attire. Claude was preceded in death by his parents; sisters, Betty Francis and Joyce Kuykendall; daughter-in-law Rebecca Perkins; and granddaughter Alexis Perkins. Claude is survived by his beloved wife of 58 years, Sherry, and four children, Tracy of Atlantic, IA, Jim of Tabor, IA, Debbie (Mike) Lesher of Tabor, and Bill (Andrea) Perkins of Cedar Rapids, IA; nine grandchildren, Daniel Perkins of Des Moines, IA, Oran and Joshua Perkins of Atlantic, Diana Perkins of Brookings, SD, Jessi Jamison of Randolph, Trevor and Emily Perkins of Tabor, and James and Josie Perkins of Cedar Rapids; step grandson Presley Lesher of Stanton, IA; as well as a host of relatives and friends. Funeral services will be held on Monday, November 26, 2018 at 10:30 am at the Nishna Valley Funeral Home in Shenandoah with Pastor Gordon Scott officiating. The family will greet relatives and friends with visitation and viewing at the funeral home Monday morning from 9:30 to 10:30 am. Memorials in Claude's name are being directed to either the Randolph Fire & Rescue or the Historic Randolph Depot Museum or to Randolph Hometown Pride. Burial will take place in the Randolph Cemetery. The family will greet relatives and friends with viewing and visitation at the funeral home.